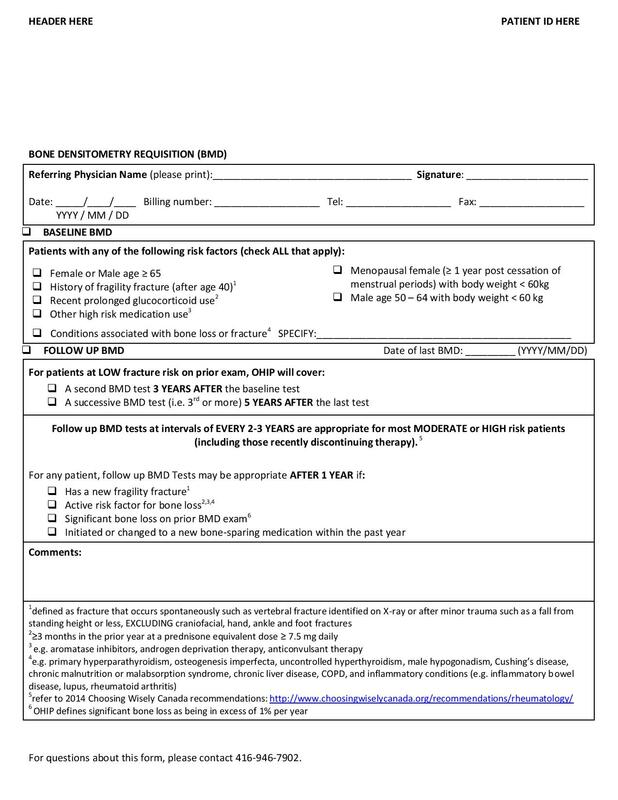 The 2010 Osteoporosis Clinical Practice Guidelines for the Diagnosis and Management of Osteoporosis represent a shift in the prevention and treatment of osteoporotic fractures, moving the focus from treating low mineral bone density (BMD) to better identifying fractures caused by weakened bones (fragility fractures). The 2010 Clinical Practice Guidelines for the Diagnosis and Management of Osteoporosis in Canada and the 2015 Clinical Practice Guidelines for the Frail Elderly offer evidence-based screening and treatment recommendations for adults over 50 years. 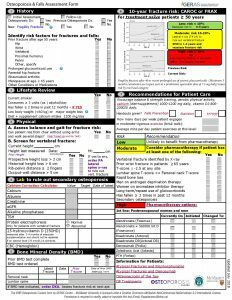 We have developed an osteoporosis and falls assessment tool in PDF and for PS Suite (Telus) and OSCAR EMR users. The tool is based on the guidelines, that can be integrated into the electronic medical records (EMR) with the aim of improving osteoporosis-related care in family practice. The Recommended Use Requisition (RUR) for referral for bone mineral density (BMD) testing was developed through the Ontario Osteoporosis Strategy by a team of researchers at Women’s College Hospital. It has been validated by the Ontario BMD Working Group (a multidisciplinary team of family physicians, radiologists, internists, and scientists) and in relation to the current clinical guidelines for BMD testing, the OHIP Fee Schedule, and recommendations from Choosing Wisely Canada. In recognition of the importance of this initiative, Choosing Wisely Canada has recently partnered with our team. Approximately half of all patients who suffer a hip fracture have already sustained a previous fracture– a ‘signal’ fracture – before breaking their hip. About 15% of hip fractures happen in patients who have already broken one hip. Hip fractures consume scarce orthopaedic resources. Osteoporotic hip fractures consume more hospital bed days than stroke, diabetes or heart attack. 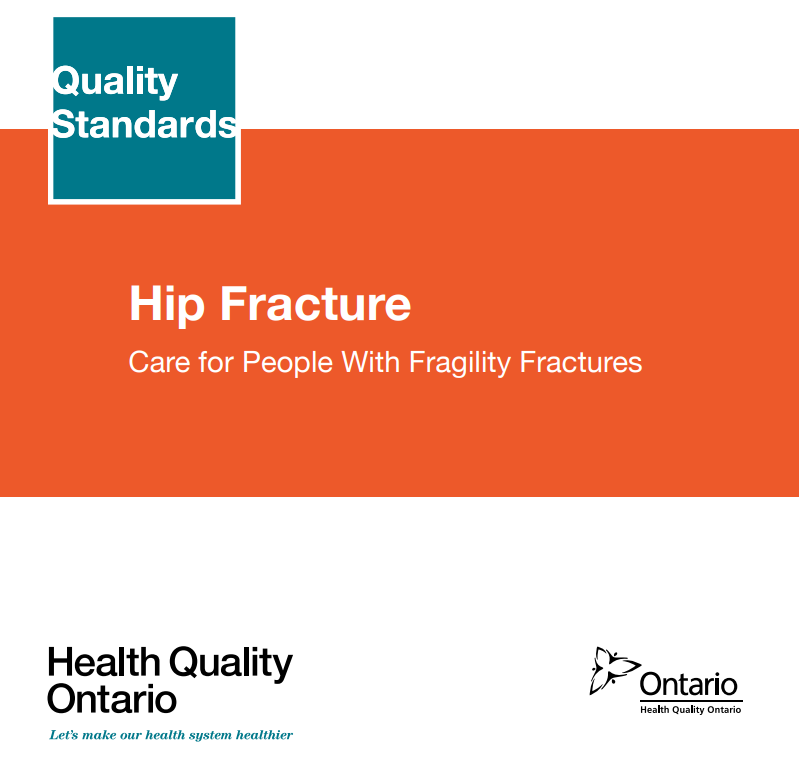 Implementation of Health Quality Ontario’s Quality Standard: Hip Fracture Care for People With Fragility Fractures is integral, not only to reduce the risk of re-fractures for people experiencing a hip fracture, but also to improve post-fracture care and reduce hospital stay time and associated costs. As a provincial stakeholder on the Quality Standards Advisory Committee, the Ontario Osteoporosis Strategy strongly supports the improvement of hip fracture care in Ontario. The Osteoporosis Strategy’s goal is to reduce hip fractures by 20% by 2020- capturing that first fracture to reduce the risk of re-fracture. Please reach out to Ontario Osteoporosis Strategy’s Regional Integration Lead in your area to be part of your Quality Improvement team as you implement the Hip Fracture QBP. Health care professionals across Ontario can use the evidence-based guidance, measurement tools and implementation supports in Health Quality Ontario’s new Hip Fracture Quality Standard to improve the quality of hip fracture care.